Stay 'Top of Mind' with your contacts! Implement low-cost, impactful e-mail campaigns that bring in more leads and revenue. Automatically push hot leads to sales fast. Gain valuable market and product insight to make better business decisions. Understand which campaigns are bringing in the most revenue and leads. Streamline sales and marketing activities through automation. Obtain actual customer responses to questions you want to know. Leads generate call lists that range your hottest prospects and customers based on how they have interacted with our campaigns. Select the hottest leads in the list and assign to account managers, schedule phone calls and to-do items that show up in account manager's activity area -- ensuring hot leads are contacted right away. Create a group that everyone can interact with. Export to Microsoft Excel and send to your sales team or call center right away. Send surveys to prospects and customers to mine valuable data for marketing and product development teams e.g., customer satisfaction surveys; testing messaging and designs; capture feature requests; and more. Build better relationships with customers -- understand if they're satisfied with your products and services; track their ratings; and have a customer service or sales rep follow-up with them. Find out who can attend your events; easily create groups based on responses to organize future communications, e.g., create a group of customers who haven't RSVP's to your event. Attach forms to brochures or white papers to capture contact information and watch your database grow -- plus understand which marketing collateral is bringing in the best leads. View reports that graphically show you open and click rates, trends over time, forwarded campaigns, etc. Understand which links in your e-mails are most effective. Infor CRM (formally Saleslogix) E-marketing is an integrated, on-demand service that extends the marketing automation capabilities of Infor CRM, enabling you to quickly and effectively reach out to your contacts, qualify and nurture leads, and grow your customer base. You can create and execute impactful e-mail campaigns and view history, interactions, and results - all within Infor CRM. 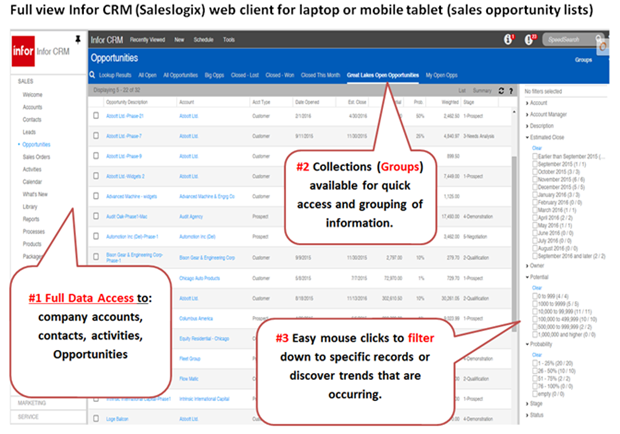 Use Infor CRM filters and group capabilities to organize campaign targets, e.g., prospects who responded to a recent survey, customers that purchased products in the last six months, etc. Select from over 130 templates that cover all of your communication needs from newsletters, e-mails, and product announcements to occasion's cards and press releases. Customize the provided pre-built templates with your logo, images, and copy -- creating professional, dynamic e-mails that engage your customers and prospects. Design and upload your own templates if you prefer, using your favorite design software. Preview communications before you send them out. Send e-mails in an instant or schedule them to send at a later date. Send e-mails on behalf of other employees, such as account managers - so they have more time to sell and you can ensure the correct branding, pricing, and messaging are communicated. View campaign details with Infor CRM, like which campaigns were sent, open and click rates, and status (opened or unopened) to facilitate more thoughtful conversations. Contact Us for more information and how this tool can benefit your electronic marketing plan for staying "Top of Mind". If you are looking to increase the success of your email marketing campaigns, call us at 1-269-445-3001 for a free consultation. See how Infor CRM e-Marketing can keep your company top of mind. 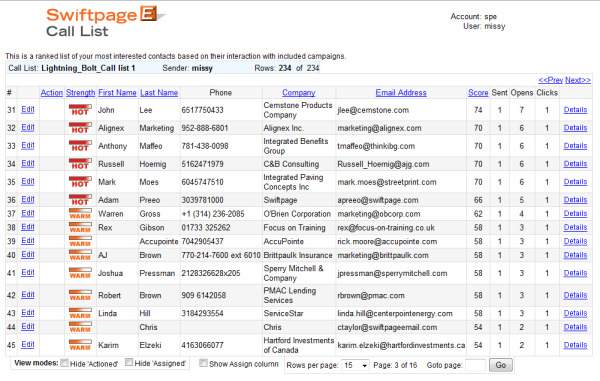 Swiftpage, the number one integrated email marketing solution for Act! and Infor CRM, provides a marketing automation platform to its already robust service - giving you the tools to automatically reach out to your Contacts, Groups, Look Ups and Companies. The integration for Act! is called Act! E-Marketing. World -Class Email Marketing - Integrated into your ACT! or Infor CRM environment gives you the ability to Create, Send and Track Email Marketing blasts. Survey Tool - Gather valuable data from prospective or current customers and automatically build new or update your existing ACT! or Infor CRM contacts. Call List - A ranked list of your most interested contacts based on the way they interacted with your email marketing blast. Snapshot tab - Gather valuable contact profile information from the web with a single click and more. Marketing Automation - "Nurture Marketing"
Drip Marketing - blends simple functionality, like the ability to automatically send a sequence of marketing messages to a contact that fills out a form on your website, with intelligent technology that will send different messages to contacts based on their previous actions. For example, send a postcard to those that did not open the previous email - automatically!